3 bedroom house with swimming pool, 3 air conditioners and free WiFi. This house is situated by 2 of the best beaches of Mauritius. Fully registered by Mauritian Tourism Authority. The property is 150 meters from the stunning beach of Trou aux Biches and 200 meters from Choisy beach with the touristic resort of Grande Bay in the distance. Within 100 meters you will find restaurants, bars, boutiques, money exchange, diving centre and the biggest deep sea fishing centre, bus stop for Port Louis and Grand Baie is only a 3 minutes walk. This 3 bedroom house has 2 bathrooms and it comes fully equipped with Satellite TV, DVD Player, CD-radio player, free wireless internet, burglar alarm, burglar bars on all windows and safe. We have a secluded front garden with comfortable chairs and table, rear garden with swimming pool and personal sun beds, table and chairs to dine under the stars at night. All 3 bedrooms have Air Conditioners plus master bedroom has a shower, toilet and sink. Ceiling fans are in 2 bedrooms and the sitting room. Aluminium windows and doors to cut down the outside noise. The kitchen comes fully equipped with 4 ring gas hob, oven, large fridge/freeze, washing machine, microwave, toaster, coffee machine. The price includes a cleaning lady who comes 3 times a week. Transfers. : Transfers can be arranged between the airport to the bungalow at a cost of 1,600 rupees or €40 depending on the exchange rate. Excursions. : We have negotiated with the taxi for excursions of the island at competitive rates. On your arrival you can take the taxi to go to the main supermarket of Super U for a return fare of 600 rupees. This includes a 1 hour wait while you go shopping. Other excursions to the north and south of the Island can be arranged, prices are displayed on a placard inside the bungalow. Arrivals and Departures: Check in on the day of arrival is mid day, and check out time on the day of departure will be 10 am unless the property is vacant, and then availability for use will be on the discretion of the owners. Please view our Tourism Registration Certificate in the photo section. We are fully licensed under the Mauritian Tourism Authority. This certificate means that we comply with the latest, stringent, requirements of the Tourism Authority for example security, alarm system connected to a security company, first aid kit, fire extinguisher. Please make sure the property you rent is registered with the authorities otherwise you will not be covered by insurance, the standard will be below the required tourism level and you will be breaking the law. My wife is Mauritian and I am a Cypriot. We live in Cyprus and my sister in law looks after the rental of the property in Mauritius. Every year we travel to Mauritius and stay in our bungalow, we take the opportunity when we are there to renovate and upgrade the property. This is why our property is kept to a high standard and all our guests enjoy the comfort of home. Ideally positioned as a holiday house next to the beach. A maid is provided three times a week by the owners (Tuesday, Thursday and Saturday). The maid can also baby sit, cook and iron and an extra charge paid directly to her. There is a burglary alarm which can be programmed by the guest, and a safe to lock up your valuables. We have now extended the front veranda so it can accommodate 6 people comfortably and installed a side gate to completely close the front garden for your privacy and security. damit wir einen Grosseinkauf machen konnten. Die Maid kocht sehr gut. Das einzige das noch notwendig waere sind Moskitonetze, denn die Schnacken waren wirklich eine Plage. Es gibt gleichum die Ecke schoene Restaurants und ein kleiner Supermarkt ist in der Naehe. Der Urlaub war wunderschoen. Alarmanlage einschalten. Wertsachen in den Tresor. The Villa is like the description. The owners are very helpfull. This house in Mon Choisy is a great place to have as a base to explore Mauritius. With close proximity to some of the best beaches on the island and restaurants and diving centres less than 1 minute walk away! A very spacious property with all 3 bedrooms good sizes. the pool is great, However, if you take children be careful as there is no side gate to completely shut off the front garden so the kids can get to the pool via the back or the front of the property. It comes with a driveway so if you hire a car it can be locked away safely within the garden. The housekeeper is great and for a small fee will cook a meal for how ever many require one (very tasty!) Towels and bedding are all provided and very clean. This is a great holiday home run by very easy to deal with people. As i said before it would benefit from a gate so the kids can play in the garden without having to watch them sneaking off for a dip!! Thanks for a very easy and pleasuable stay at this great little house. Nous avons passé 2 semaines de vacances très agréables en novembre 2008. La villa est tout à fait conforme à l'annonce. Nous sommes allés avec notre petit bébé et tout s'est agréablement bien passé (super U à 10 min). Nous avons été TRES TRES bien accueillis et tout a été fait pour que nos vacances se déroulent à merveille. Il serait très difficile de ne pas recommander cette villa. 150 meters from 2 of the best beaches in Mauritius, and only a 10min bus ride to Grand Baie, the tourist capital of the island. Deep sea fishing centre is only 5 min walk plus diving, snorkelling and local shops and mini market. 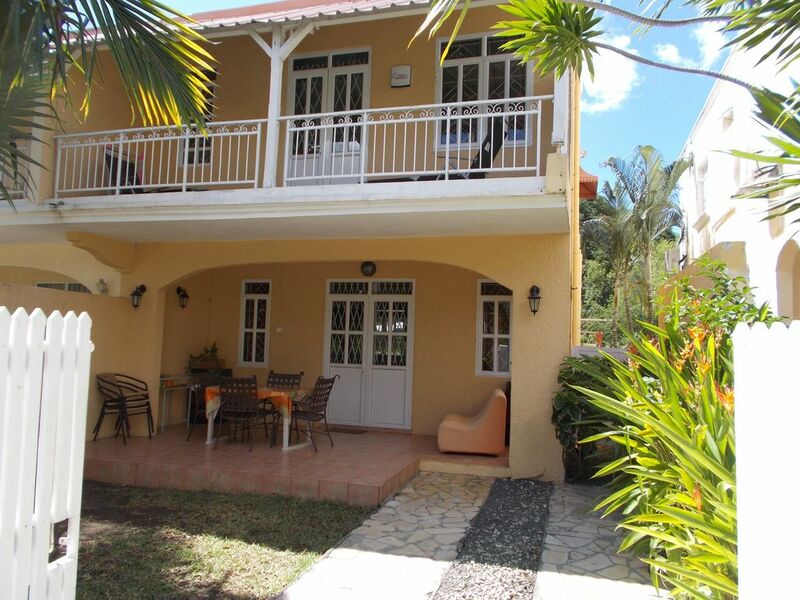 This property is ideally located in a quite area but 5 min away from a thriving touristic location. You have 2 golden beaches and within close proximity is Grand Baie with night clubs restaurants and shopping centres. This Villa is very well equipped to service all your needs and with a private swimming pool for the 4 Bungalows, you can really have a relaxing and comfortable stay. The Villa has a safe and also Burglar alarm which you can arm yourself for your safety. We have been registered under the Mauritian Tourism law for 8 years and conforms to the highest standards. The bungalow has free, unlimited WiFi internet access. Check-out is at 10am. Check-in at 12am or earlier if the bungalow is available. To confirm booking please forward a 25% deposit to the owners. You can pay this through bank transfer or Paypal.